This is an incredibly quick to prepare Italian-inspired soup that's full of fresh flavours. Serve it with warm ciabatta for an authentic meal. Finely chop the onion, celery stick and the baby courgettes. Heat some olive oil in a frying pan and sauté the vegetables until golden and coloured. Add the stock to the pan and bring it to a simmer. Season the liquid. 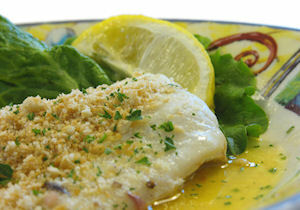 Drop in the haddock fillet and cook for another 5 minutes or until the fish flakes. Stir in the cannellini beans, double cream and fresh dill. Heat the soup so that it almost comes back to the boil, then remove it from the heat and serve.